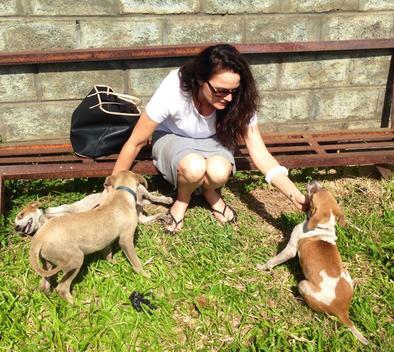 Passionate and dedicated to the cause, Leslie has been known to rescue animals without discrimination. From dumpsters to airports, cat colonies to leftover litters, Les is a great addition to the team! "The island is very much in need of the VSPCA as we are one of the last islands in the Caribbean to achieve an animal welfare program. We have and continue to pick up stray animals, most of which I place with my mum! Some of our greatest dog companions were found as puppies in the dumpster right here in Villa. On our list of saves are iguanas, baby birds and even a sea turtle or two. Leslie has also been the mother to a few calves, pigs, chickens, one monkey, a donkey and a mongoose, oh also a family of hairless baby rats! I look forward to getting involved with the spaying and neutering programs. I would like to see the licensing of owned cats and dogs. The pick up, rehabilitation and relocation of all those forgotten animals. I would LOVE to achieve a VSPCA care facility where we could house and care for all stray and abused animals. I would LOVE LOVE LOVE to see Vincentians treat their animals and pets the way they should and the way 'God' intended all his creatures to be treated, and the education of young minds so they grow up with kind and loving hearts towards all animals."